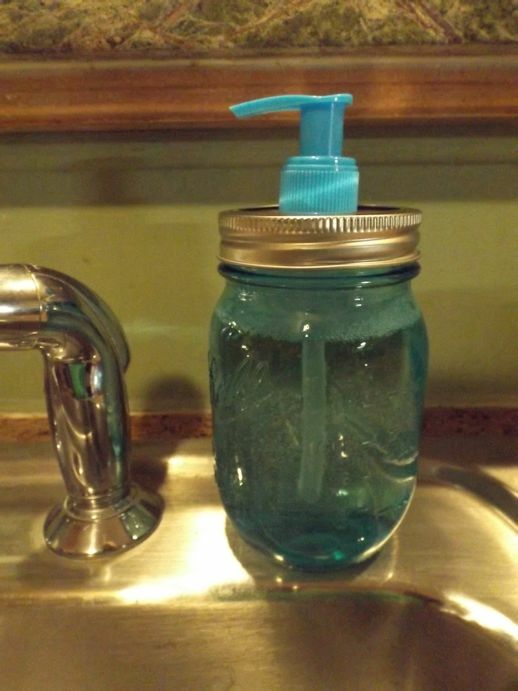 Ever since seeing these canning jar soap dispenser all over the internet, I have wanted one. I’m not sure why. It doesn’t really go with my home decor, but I have had this project on the back burner of my mind for a long time. I guess my inner country girl was yearning for clean hands. Canning jars just seem to evoke a kinder, gentler time for everyone and if I can go there with a squirt of soap, I’m in! Have you seen these new blue Ball canning jars? I bought some last summer and then didn’t do any canning so I have the entire 6-pack still untouched and waiting for me to fill them. I was at Bed Bath and Beyond tonight and they are selling their Christmas hand soaps on sale, drastically reduced, and when I spotted a blue topped snowman hand soap an idea was born. I no longer had to be one of the few people on the globe without a canning jar soap dispenser. After all this time of being without, the actual project took all of about 10 minutes. 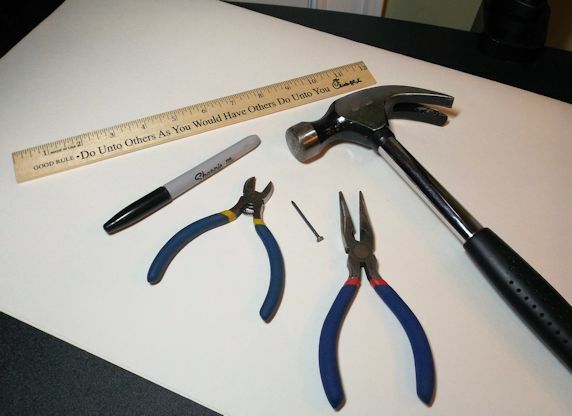 Here are the tools you will need: ruler, Sharpie marker, pliers, hammer, nail, surface for pounding. Step 1: Find center of the canning jar lid. Use a Sharpie to make a circle the same size as the soap dispenser nozzle that has to fit through it. Mine was 5/8″. Step 2: Use a hammer and nail to make holes all around the black Sharpie dot as close together as possible. I found a cookbook and then put one an old magazine on top of it. I hammered on the kitchen counter because I don’t have a workbench. Step 3: Use the sharp cutting pliers (I don’t know its correct name) to cut a space between two of the holes. 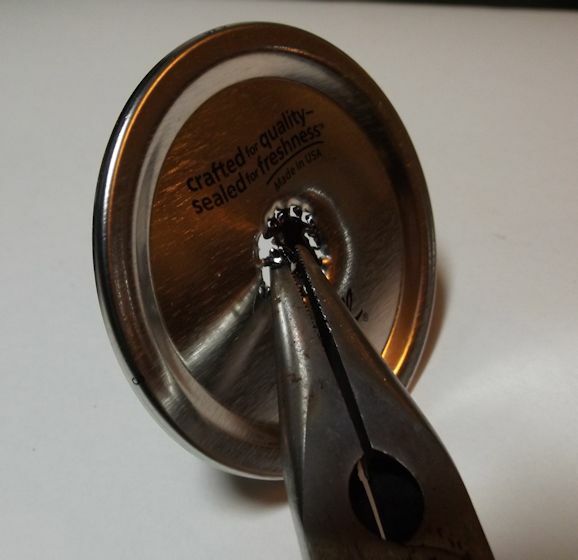 Use the needle nose pliers to snap out the rest of the circle. 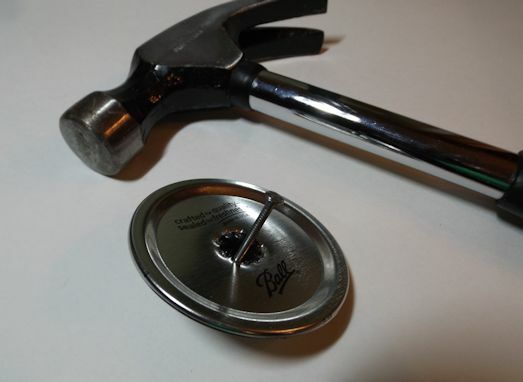 Step 4: Flatten the lid with the hammer if it got bent out of shape in step 3. Then try to place your dispenser in the hole. If it is too small, then use the pliers to bend back the hole slightly from the underside of the lid. 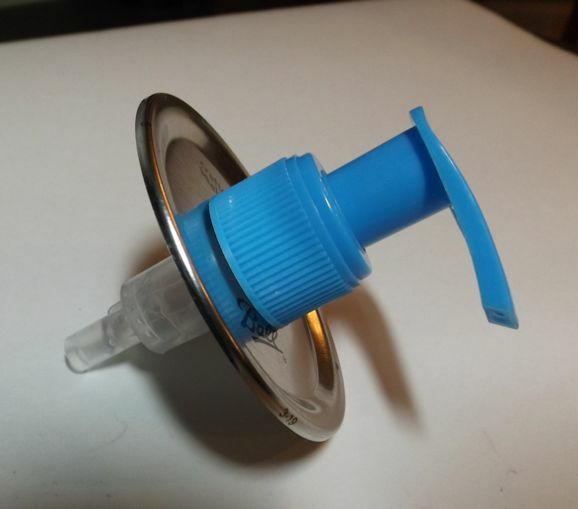 Step 5: Push the dispenser top through the hole. 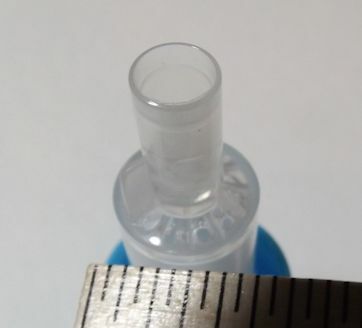 You can glue it or put silicone adhesive on the underside but I don’t imagine these plastic pump dispensers will last forever so I am not going to bother. It will be very easy to make another one when this dispenser quits working. Place soap in the jar. Screw on the top and pump away for sudsy, clean hands.